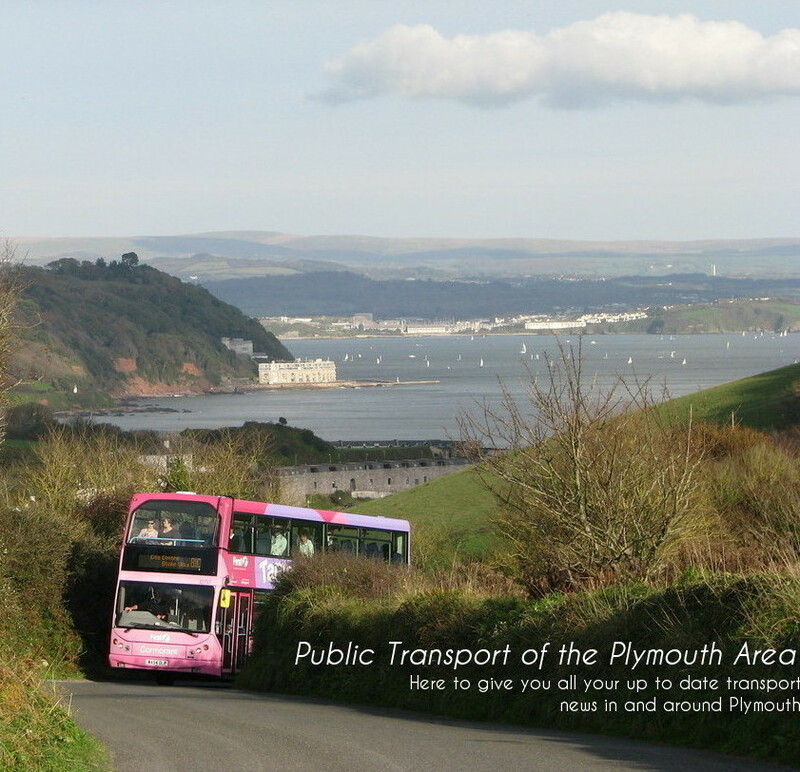 Public Transport Of The Plymouth Area: Going for Gold! Stagecoach now seem to be well prepared for the launch of their new Gold services, linking the English Riviera with Plymouth and Dartmouth. With many thanks to Nathan Bentham I can bring you these exclusive photos of 3 of the 9 Scania N230UDs that are currently in Plaxton's holding yard in Leyland awaiting registration onto '63' plate, and then delivery. The fleet numbers are believed to be 15924 through to 15932. 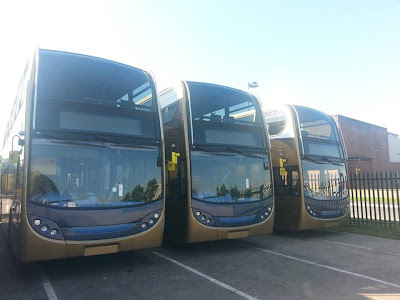 As we now expect from Stagecoach Gold the vehicles look very impressive indeed, and are certainly a huge step up from First's flimsy seated Ex-Bath Park and Ride Tridents. The timetable is certainly an interesting read though, with service timings not necessarily what I was expecting to see. I have to admit to thinking that Stagecoach would opt for a classic tactic, timing their services 5-10 minutes ahead of the competing First routes in order to cream off the passengers, using the tactic of getting people on the first bus that turns up, but no! Instead, Stagecoach have been very sensible with their service timings, slotting the service right in between the X80 and X81 between Torquay and Totnes, the busiest part of the corridor, and then 15 minutes ahead of each from Plymouth and Dartmouth respectively. This seems interesting. 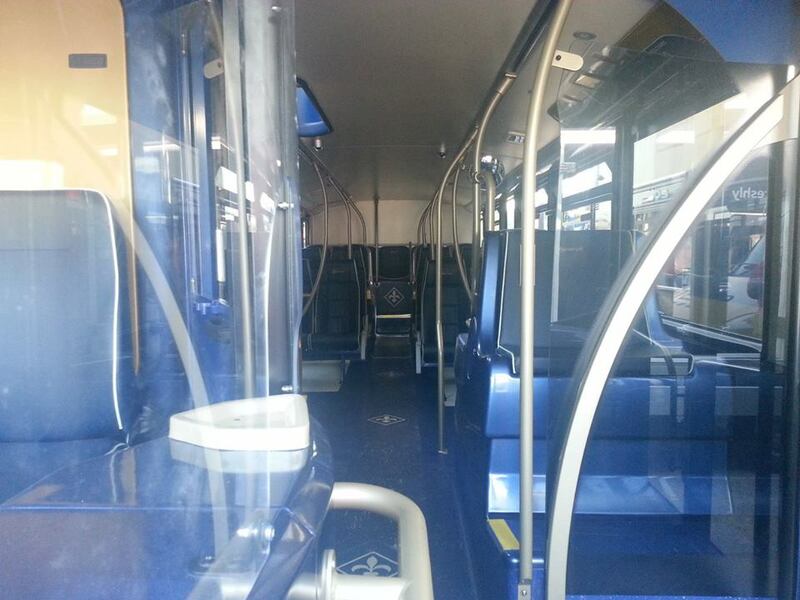 Although this will be the ideal situation for Concessionary Pass users, offering a more frequent service to them, I would doubt this would attract normal fare paying passengers. Certainly on trips I've done on the routes, a high proportion of the users do use Concessionary passes, but still, running 5 minutes ahead will still mean they get more of them, rather than hoping that they will be sitting around a fair amount of time before the normal offering leaves. Stagecoach's Gold certainly appears to offer a more usable service though, with services starting earlier, and finishing later in the locations that I would presume matter most, in what I'd presume would be the directions that would potentially see the largest demand. Indeed from Plymouth, Stagecoach run 2 1/2 hours later into the evening than First do - a huge leap. But of course, this is vice versa on the Torquay end, where Stagecoach's last service departs 2hours 45 minutes earlier than First's final service. Of course I haven't got any figures infront of me, and this is purely speculative, but I would guess there is a bigger shift in the morning towards Plymouth, and hence, a larger move outbound from Plymouth in the evening, and hence the opposite would be seen further up the route. Then again, Totnes passengers I would presume generally head West to Paignton and Torquay rather than to Plymouth and Dartmouth, so both companies likely have their own advantages. Another interesting thing to discover was that Stagecoach have added in an extra stop on Royal Parade, departing from the already busy A11 outside Poundland. With 12 minutes layover, this could be interesting, even if they do wait time in the now reduced amount of space available outside the Theatre Royal. Although there is of course added convenience with a stop on Royal Parade, it will be 8 minutes before passengers actually depart the City Centre, as Stagecoach will also drop down to serve Bretonside before heading off towards the A38. Very interesting times ahead on the route though, and I look forward to seeing how passengers will react to Stagecoach's very impressive new routes. As I'm moving to South Devon I might give this route a try! Anything is better than First another Enviro 400 route I would like to try is the Red Flash one in Plymouth!